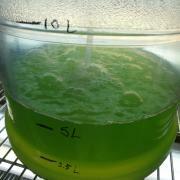 Research is examining microalgae, 20 to 80 percent oil by dry weight biomass, as a biofuel energy crop. Learn about algae production in ponds and photobioreactors, yields, costs and challenges to this exciting new feedstock for biodiesel production. Algae are organisms that grow in aquatic environments and use light and carbon dioxide (CO2) to create biomass. There are two classifications of algae: macroalgae and microalgae. Macroalgae, which are measured in inches, are the large, multi-cellular algae often seen growing in ponds. These larger algae can grow in a variety of ways. The largest multicellular algae are called seaweed; an example is the giant kelp plant, which can be more than 100 feet long. 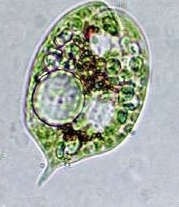 Microalgae, on the other hand, are measured in micrometers and are tiny, unicellular algae that normally grow in suspension within a body of water. Microalgae have long been recognized as potentially good sources for biofuel production because of their relatively high oil content and rapid biomass production. Microalgae grow very quickly compared to terrestrial crops; the practice of algal mass culture can be performed on non-arable lands using non-potable saline water and waste water. Thus, use of microalgae as an alternative biodiesel biofuel feedstock is gaining increasing interest from researchers, entrepreneurs, and the general public. Algal biomass contains three main components: carbohydrates, proteins, and lipids/natural oils. Because the bulk of the natural oil made by microalgae is in the form of tricylglycerol (Figure 1), which is the right kind of oil for producing biodiesel, microalgae are the exclusive focus in the algae-to-biodiesel arena. In addition to biodiesel, microalgae can also be used to generate energy in several other ways. Some algal species can produce hydrogen gas under specialized growth conditions. The biomass from algae can also be burned similar to wood or anaerobically digested to produce methane biogas to generate heat and electricity. Algal biomass can also be treated by pyrolysis to generate crude bio-oil. Microalgae grow quickly and contain high oil content compared with terrestrial crops, which take a season to grow and only contain a maximum of about 5 percent dry weight of oil, (Chisti, 2007). They commonly double in size every 24 hours. During the peak growth phase, some microalgae can double every three and one-half hours (Chisti, 2007). Oil content of microalgae is usually between 20 percent and 50 percent (dry weight, Table 1), while some strains can reach as high as 80 percent (Metting, 1996; Spolaore et al., 2006). This is why microalgae are the focus in the algae-to-biofuel arena. Table 1. Oil content of microalgae. Table 2. Oil yields based on crop type. Most microalgae are strictly photosynthetic — that is, they need a light and carbon dioxide as energy and carbon sources. This culture mode is usually called photoautotrophic. Some algae species, however, are capable of growing in darkness and using organic carbons such as glucose or acetate as energy and carbon sources. This culture mode is termed heterotrophic. Due to high capital and operational costs, heterotrophic algal culture is hard to justify for biodiesel production. In order to minimize costs, algal biofuel production usually relies on photoautotrophic culture that uses sunlight as a free source of light. Phototrophic microalgae require light, carbon dioxide, water, and inorganic salts to grow. The culture temperature should be between 15 and 30°C (~60-80°F) for optimal growth. The growth medium must contribute the inorganic elements that help make up the algal cell, such as nitrogen, phosphorus, iron, and sometimes silicon (Grobbelaar, 2004). For large-scale production of microalgae, algal cells are continuously mixed to prevent the algal biomass from settling (Molina Grima et al., 1999), and nutrients are provided during daylight hours when the algae are reproducing. However, up to one-quarter of algal biomass produced during the day can be lost through respiration during the night (Chisti, 2007). A variety of photoautotrophic-based microalgal culture systems are available. For example, the algae can be grown in suspension or attached on solid surface. Each system has its own advantages and disadvantages. Currently, the suspension-based open ponds and enclosed photobioreactors are commonly used for algal biofuel production. In general, an open pond is simply a series of raceways outside, while a photobioreactor is a sophisticated reactor design which can be placed indoors in a greenhouse, or outdoors. The details of the two systems are described below. Figure 2. Schematic open pond system for algal culture. Open ponds: Open ponds are the oldest and simplest systems for mass cultivation of microalgae. In this system, the shallow pond is usually about 1 foot deep; algae are cultured under conditions identical to their natural environment. 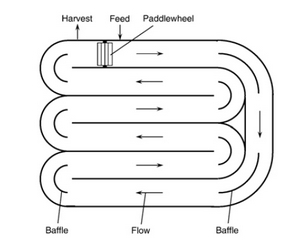 The pond is designed in a raceway configuration, in which a paddlewheel provides circulation and mixing of the algal cells and nutrients (Figure 2). The raceways are typically made from poured concrete, or they are simply dug into the earth and lined with plastic to prevent the ground from soaking up the liquid. Baffles in the channel guide the flow around bends in order to minimize space. The system is often operated in a continuous mode — that is, the fresh feed containing nutrients including nitrogen phosphorus and inorganic salts is added in front of the paddle wheel. Algal broth is harvested behind the paddle wheel after it has circulated through the loop (Figure 2). Depending on the nutrients required by algal species, a variety of wastewater sources can be used for the algal culture, such as dairy/swine lagoon effluent and municipal wastewater. For some marine types of microalgae, seawater or water with high salinity can be used. Although open ponds cost less to build and operate than enclosed photobioreactors, this culture system has its intrinsic disadvantages. Since these are open-air systems, they often experience a lot of water loss due to evaporation. Thus, microalgae growing in an open pond do not uptake carbon dioxide efficiently, and algal biomass production is limited (Chisti, 2007). Biomass productivity is also limited by contamination with unwanted algal species as well as other organisms from feed. In addition, optimal culture conditions are difficult to maintain in open ponds, and recovering the biomass from such a dilute culture is expensive (Molina Grima et al., 1999). Image of an open pond system. 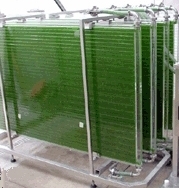 Image of an algae photobioreactor. Enclosed photobioreactors: Enclosed photobioreactors have been employed to overcome the contamination and evaporation problems encountered in open ponds (Molina Grima et al., 1999). These systems are made of transparent materials and generally placed outdoors for illumination by natural light. The cultivation vessels have a large surface area-to-volume ratio. The most widely used photobioreactor is a tubular design, which has a number of clear transparent tubes, usually aligned with the sun rays (Figure 3). The tubes are generally less than 10 centimeters in diameter to maximize sunlight penetration (Chisti, 2007). The medium broth is circulated through a pump to the tubes, where it is exposed to light for photosynthesis, and then back to a reservoir. The algal biomass is prevented from settling by maintaining a highly turbulent flow within the reactor, using either a mechanical pump or an airlift pump (Chisti, 2007). A portion of the algae is usually harvested after the solar collection tubes. In this way, continuous algal culture is possible (Chisti, 2007). In some photobioreactors, the tubes are coiled spirals to form what is known as a helical tubular photobioreactor, but these sometimes require artificial illumination, which adds to the production cost. Therefore, this technology is only used for high-value products, not biodiesel feedstock. Figure 3. 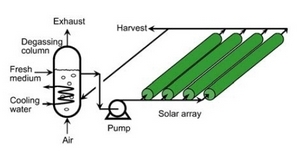 Schematic tubular photobioreactor. The photosynthesis process generates oxygen. In an open-raceway system, this is not a problem as the oxygen is simply returned to the atmosphere. However, in the closed photobioreactor, the oxygen levels will build up until they inhibit and poison the algae. The culture must periodically be returned to a degassing zone, an area where the algal broth is bubbled with air to remove the excess oxygen. Also, the algae use carbon dioxide, which can cause carbon starvation and an increase in pH. Therefore, carbon dioxide must be fed into the system in order to successfully cultivate the microalgae on a large scale. Photobioreactors may require cooling during daylight hours, and the temperature must be regulated at night hours as well. This may be done through heat exchangers, located either in the tubes themselves or in the degassing column. The advantages of the enclosed photobioreactors are obvious. They can overcome the problems of contamination and evaporation encountered in open ponds (Molina Grima et al., 1999). The biomass productivity of photobioreactors can be 13 times greater than that of a traditional raceway pond, on average (Chisti, 2007). Harvesting of biomass from photobioreactors is less expensive than that from a raceway pond, since the typical algal biomass is about 30 times as concentrated as the biomass found in raceways (Chisti, 2007). However, enclosed photobioreactors also have some disadvantages. For example, the reactors are more expensive and difficult to scale up. Moreover, light limitation cannot be entirely overcome since light penetration is inversely proportional to the cell concentration. Attachment of cells to the tube walls may also prevent light penetration. Although enclosed systems can enhance the biomass concentration, the growth of microalgae is still suboptimal due to variations in temperature and light intensity. Harvesting: After growing in open ponds or photobioreactors, the microalgae biomass needs to be harvested for further processing. The commonly used harvest method is through gravity settlement, or centrifuge. The oil from the biomass will be removed through solvent extraction and further processed into biodiesel. Depending on the culture systems used (opens ponds vs.enclosed photobioreactors), microalgae production yield is expressed as the amount of biomass per unit of surface area (for open ponds), or per unit of reactor volume (for enclosed photobioreactors). A typical open pond can produce 5 to 10 grams of biomass (dry basis) per m2 of surface area per day, which translates to 7.4 to 14.8 tons (dry biomass) per acre per year. Some researchers reported that biomass yield can be as high as 50 g/m2 per day, i.e., 74 ton biomass/m2 per year in an open pond. For enclosed photobioreactors, the biomass yield can be approximately 2 to 3 gram/L per day, i.e., 0.73-1.05 ton (dry biomass)/m3 per year. The oil content of the dry biomass is a highly variable parameter (Table 1), while some strains can reach as high as 80 percent (Metting 1996; Spolaore et al. 2006). Table 2 lists the potential yields of oil produced by various crops and compares these values to oil yields from an open pond growing microalgae. The U.S. Department of Energy (DOE) has performed a significant effort to pursue the commercial production of algal biofuel through its ASP program from the 1980s to 1990s. After 16 years of research, DOE concluded that the algal biofuel production was still too expensive to be commercialized in the near future. Three major factors limiting commercial algal production exist: the difficulty of maintaining desirable species in the culture system, the low yield of algal oil, and the high cost of harvesting the algal biomass. DOE concluded that there was a significant amount of land, water, and CO2 to support the algal biofuel technology. Increasing oil content of existing strains or selecting new strains with high oil content. Increasing growth rate of algae. Developing robust algal-growing systems in either an open-air environment or an enclosed environment. Co-product development other than the oil. Developing an efficient oil-extraction method. One way to achieve these goals is to genetically and metabolically alter algal species. The other is to develop new or improve existing growth technologies so that the same goals listed above are met. However, it should be noted that this new wave of interest has yet to result in a significant breakthrough. The production cost of the algal oil depends on many factors such as the yield of biomass from the culture system, the oil content, the scale of production systems, and the cost of recovering oil from algal biomass. Currently, algal oil production is still far more expensive than petroleum diesel fuels. For example, Chisti (2007) estimated the production cost of algae oil from a photobioreactor with an annual production capacity of 10,000 tons per year. Assuming the oil content of the algae to be around 30 percent, the author determined a production cost of $2.80/L ($10.50/gallon) of algal oil. This estimation did not include the costs of converting algal oil to biodiesel, or the distribution and marketing cost for biodiesel and taxes. At the same time, the petroleum diesel price was $2.00 to $3.00 per gallon. This equation assumes that algal oil has roughly 80 percent of the caloric energy value of crude petroleum. For example, with petroleum price at $100/barrel, algal oil should cost no more than $2.59/gallon in order to be competitive with petroleum diesel. In addition to producing biofuel, algae can also be explored for a variety of other uses, such as fertilizer and pollution control. Certain species of algae can be land-applied for use as an organic fertilizer, either in its raw or semi-decomposed form (Thomas, 2002). Algae can be grown in ponds to collect fertilizer runoff from farms; the nutrient-rich algae can then be collected and reapplied as fertilizer, potentially reducing crop-production costs. In wastewater-treatment facilities, microalgae can be used to reduce the amount of chemicals needed to clean and purify water. In addition, algae can also be used for reducing the emissions of CO2 from power plants. Coal is, by far, the largest fossil energy resource available in the world. About one-fourth of the world’s coal reserves reside in the United States. Consumption of coal will continue to grow over the coming decades, both in the United States and the world. Through photosynthetic metabolism, microalgae absorb CO2 and release oxygen. If an algae farm is built close to a power plant, CO2 produced by the power plant could be utilized as a carbon source for algal growth, and the carbon emissions would be reduced by recycling waste CO2 from power plants into clean-burning biodiesel. Microalgae are an ideal biodiesel feedstock, which eventually could replace petroleum-based fuel due to several advantages, such as high oil content, high rates of production, less land, etc. Currently, algal biodiesel production is still too expensive to be commercialized. Due to the static costs associated with oil extraction and biodiesel processing and the variability of algal biomass production, cost-saving efforts for algal oil production should focus on the production method of the oil-rich algae itself. This needs to be approached through enhancing both algal biology (in terms of biomass yield and oil content) and culture-system engineering. In addition, using all aspects of the microalgae for producing various value-added products besides the algal fuel, via an integrated biorefinery, is an appealing way to lower the cost of algal biofuel production. Indeed, microalgae contain a large percentage of oil, with the remaining parts consisting of large quantities of proteins, carbohydrates, and other nutrients (Spolaore et al., 2006). This makes the post-oil extraction residue attractive for use as animal feed or in other value-added products. Chisti, Y. 2007. Biodiesel from microalgae. Biotechnology Advances 25:294-306. Grobbelaar, J.U. 2004. Algal nutrition. In: A. Richmond, ed. Handbook of Microalgal Culture: Biotechnology and Applied Phycology. Blackwell Publishing. pp. 97-115. Molina, Grima E., Acien, Fernandez F.G., Garcia, Camacho F., Chisti, Y. 1999. Photobioreactors: Light regime, mass transfer, and scale up. Journal of Biotechnology 70:231-247. Spolaore, P., Joannis-Cassan, C., Duran, E., Isambert, A. 2006. Commercial application of microalgae. Journal of Bioscience and Bioengineering 101:87-96. Thomas, D.N. 2002. Seaweeds. The Natural History Museum: London. ISBN 0 565 09175 1.